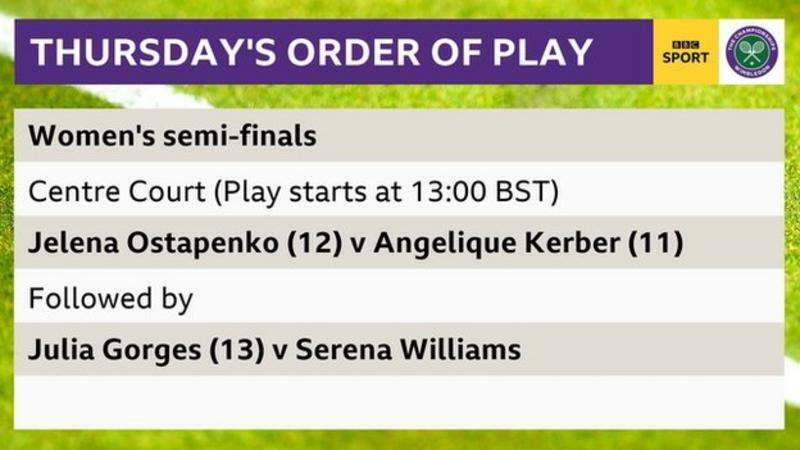 Shocks decimated the women's draw early on but there is no real surprise that three of the players in Thursday's semi-finals are Grand Slam champions. And even less so that seven-time Wimbledon champion Serena Williams is one of them, even if it is just 10 months since she gave birth. The American takes on Germany's Julia Gorges, with 2016 Australian and US Open champion Angelique Kerber facing 2017 French Open champion Jelena Ostapenko in the other battle for a place in Saturday's final. While there has been a sense of inevitability about Williams' march through the rounds, dropping just one set on her way and yet to face a top-50 player, Gorges says it is "unreal" for her to be into her first Grand Slam semi-final. The world number 13 even apologised to her quarter-final opponent and friend Kiki Bertens for beating her but will have to be a bit more hard-nosed about things if she is to stop Williams reaching a 10th Wimbledon final. Expect short rallies in a contest between the two leading servers of the championships so far, with Gorges having delivered 44 aces to Williams' 39. Gorges, 29, says it is an "honour" to share the court with Williams and that it is a reward for her decision three years ago to "start from zero" by changing her coach and physio and moving from the north to the south of Germany. With Kerber still here too, it marks the first time in the Open era - since tennis went professional in 1968 - that there have been two Germans in the women's semi-finals. Left-hander Kerber, runner-up to Williams at the All England Club in 2016, has been involved in six of the top 20 longest rallies here this year and says she has been trying to be more aggressive than her usually defensive style. The 11th seed has never faced Ostapenko, who says she is playing with freedom after the disappointment of her French Open title defence ending with a first-round exit in May. The 21-year-old Latvian revealed she has a novel way of improving her balance and composure on the tennis court - ballroom dancing. But who will be dancing into the final?